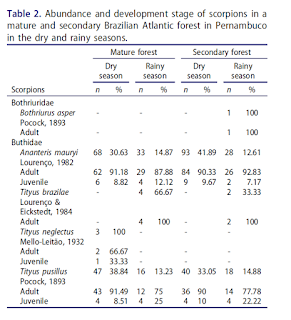 Andre Lira and co-workers have recently published a study on the effects of habitat loss in scorpions in the Brazilian Atlantic Forest. The study also looks at the status on the populations after the original habitat is being restored and what other factors may affect the populations. Habitat loss due to forest degradation can induce changes in species richness due to variation in species susceptibility to environmental stress. This is particularly important for species with highly specific microhabitats, such as scorpions that inhabit forest habitats. In this study, the richness and abundance of these arachnids were compared between an old-growth (mature) and secondary (65 years under natural restoration) forests. Seasonal influence was also evaluated by comparing diversity between dry and wet seasons. The animals were collected through nocturnal active search using UV lamps and pitfall traps in both areas (old-growth and secondary). Both environments showed similar breast heights of trees, litter depth, litter dry mass, and understory density, indicating a high level of restoration. 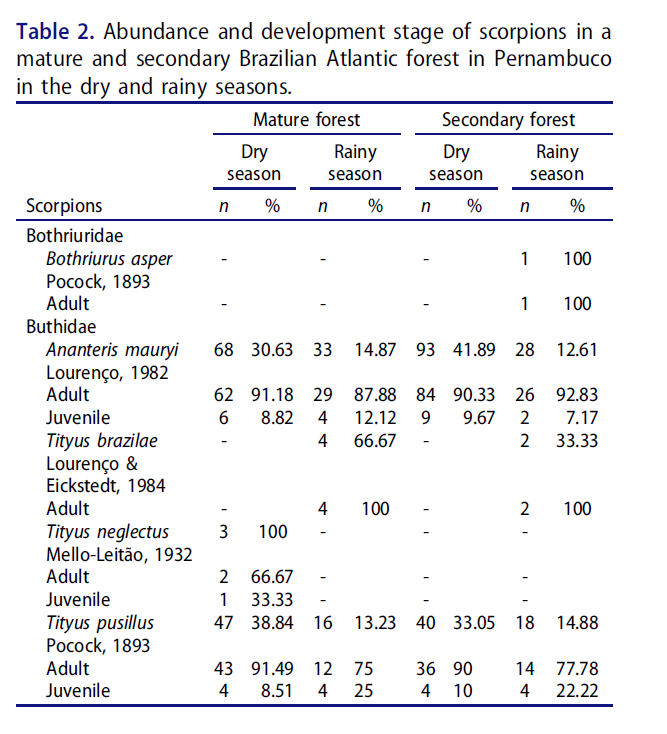 Scorpion diversity (characterized by Tityus pusillus, T. neglectus, T. brazilae, Bothriurus asper, and Ananteris mauryi) and abundance were not influenced by the different historical usage of both areas. In contrast, the abundance of these arachnids was highly affected by rain regimes, and increased during the dry season. These results suggest that 65 years was a sufficient time period for restoration, making it possible to maintain similar scorpion assemblages in both environments. Thanks to Andre Lira for sending me their paper!